After four trips to Iraq to embed with Stryker Brigades from Ft. Lewis, I now head to Afghanistan to embed with the men and women serving with the 864th Combat Engineer Battalion. I have taken to privately referring to the work being done by our soldiers in support of the Global War on Terror in Afghanistan as the “forgotten war.” Rarely do I see photographs or read articles about what our soldiers are accomplishing in that country reported in the news. Indeed, when it comes to the war on terror, the presidential candidates sometimes talk about Iraq; however, they rarely mention anything about Afghanistan. This silence does not mean that these soldiers should not have their stories told; indeed, the work they do is just as important as any other work done by any other soldiers anywhere in the world. Thus, I will tell some of the stories of the good work that is being done in Afghanistan by these soldiers – your loved ones. This is a concept that some individuals – primarily on-post – cannot or will not understand. Be that as it may, I am confident that many of you who read this blog do comprehend the simple concept that some photojournalists like me actually do support and respect our soldiers, the work they do and the sacrifices they and their families make. One who understands is Allen Cunniff. I have never met this gentleman, but he knows of me through my writing and photography. To that end, he sought me out and contributed funds to help ease some of the financial burden I face in making this trip. Suffice it to say, all communications between Afghanistan and the Fort Lewis Ranger newspaper will be paid for by his contribution. Moreover, Jordan and Donna Haines, owners of Coinforce.com, also clearly understand and appreciate the work I have accomplished and wish to continue. For the third time, they have contributed a significant sum that has gone a long way in covering the costs of this trip. And last, my wife, Melanie, understands. Were it not for her love and support, none of this work would happen. She has stood and watched me depart five times to cover Fort Lewis soldiers. To both Allen Cunniff and the Haines, I am most grateful for their help and their understanding of what I am about. Thank you for your support. And to my wife, there are no words to express my gratitude. My articles and photographs will appear in the aforementioned Fort Lewis Ranger Newspaper toward the end of March and in early April. Moreover, KCPQ - Channel 13, Fox News will also air some of my work sometime in mid-April. I will let you know the exact times and dates when they become available. To those of you who have written or called me to thank me for my previous work, I only want to say that your words of kindness and support mean a great deal to me and influence my work. I honor our soldiers, their service in a far-off country and their families. For those who have enjoyed John Simpson's photographs and stories inside the Fort Lewis Ranger and NW Veteran, including his two trips (and soon to be third trip) to Iraq, Friday night on KCPQ 13, the tables are turned. John will be the focus of an interview about his work serving the greater military community in the South Sound. Catch the interview roughly between 10:30 and 11:00 p.m. July 6th. 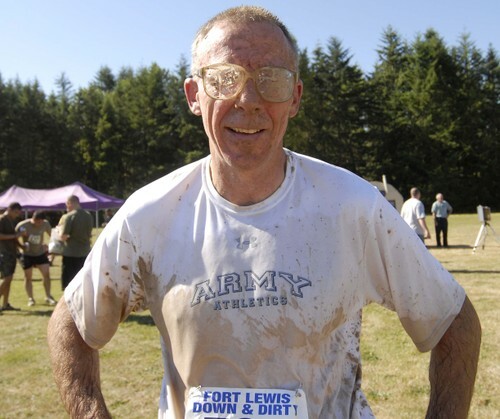 Below is a photo of John competing Wednesday in the Fort Lewis Mud Run (photo by John's wife Melanie). 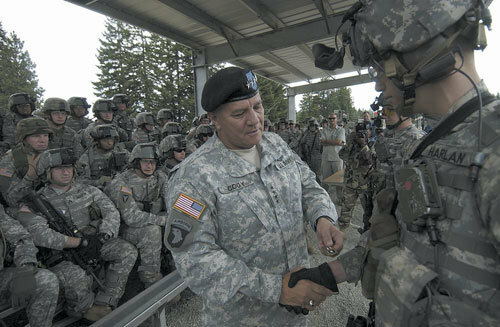 I will miss Lt. Gen. Dubik. He will relinquish command of I Corps and Fort Lewis to Brig. Gen. William Troy, the post’s deputy commanding general, on Monday, April 26th. Dubik has been assigned to take over leadership of the Multi-National Security Transition Command-Iraq. He faces a daunting task … to accelerate the training of the Iraqi Police and the Iraqi Army while building the institutions required to sustain them. 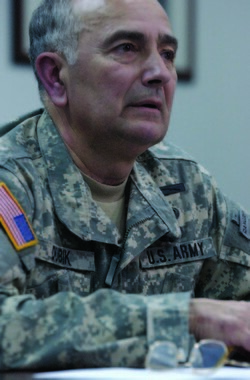 Dubik sought the job, one that general officers from other branches of service sought as well. Dubik, however, was chosen and confirmed by the Senate. He assumes his new responsibilities in the middle of May. “I am glad and honored to be selected,” he said. And very humble; he is well aware of the human cost. 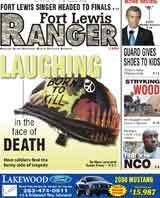 At this moment, ninety-nine Fort Lewis soldiers have died in Iraq. When asked if there would be any significance to the loss of the post’s 100th soldier, Dubik quietly said no. “Numbers don’t carry the human weight of a single death,” he added. But Dubik made it clear that if the ideology and attendant force of terrorism are not confronted, they will continue to be a threat to our children. “On behalf of my grandchildren, I want it stopped,” stated Dubik. And he is grateful for the sacrifices made by the soldiers under his command and their family members. He knows they have been asked to sacrifice much. “They know the demands are important; that it is worth their sacrifices,” he added. And they know that he cares. If you would like to wish Lt. Gen. Dubik and his wife, Ms. Sharon Basso, farewell, please feel free to comment.